Enjoy beachside vacationing in this well maintained two-story, two-bedroom unit just 200 steps from the sand, boardwalk and Pismo Pier. Located off Cypress and Stimson Avenue - our newly renovated condo is within easy walking distance to shops, restaurants and bike rentals. This home-away-from-home features a furnished private patio, BBQ, contemporary furnishings in the living and dining areas, a well-appointed kitchen and parking for two cars. Additional street parking is available for oversized vehicles. The living room has a sofa, coffee table, reclining chair with an ottoman and a 42” flat screen TV. The dining room has a table that seats up to six and faces a slider door to the private patio. The fully equipped kitchen includes a dishwasher, countertop microwave and plenty of cabinet and counter space for preparing your meals. Enjoy the patio table for four complete with an umbrella, and BBQ – isn’t there something great about grilled food and the salt air? Whether you surf or would like to watch some of the best surfing talent in action, this property may be just for you. Surfing lessons and equipment rentals are available nearby if you want to give it a whirl. Other fun local water sports include coastal kayaking, stand-up paddle boarding, ocean fishing right off the pier, and the ability to walk for miles along the water’s edge. Oh, and if you happen to be here on a Wednesday, there is a Farmers Market just off the boardwalk at the pier from 3p – 7p where you can buy local fruits and veggies. If sunsets and sunrises are your thing, you’ll be all set to take a stroll and witness the magic with an incredible backdrop of the coastal hills. For wine lovers, and those who wish to learn more about wine – there are a host of vineyards with tasting rooms nearby for your enjoyment. The master bedroom features a comfy queen-sized bed, a dresser that provides plenty of room for your clothes, a closet, and flat-screen TV. The second bedroom includes a luxurious queen-sized bed, closet, dresser, and bedside music player. All linens are of high quality and both bathing and beach towels are provided for your use. 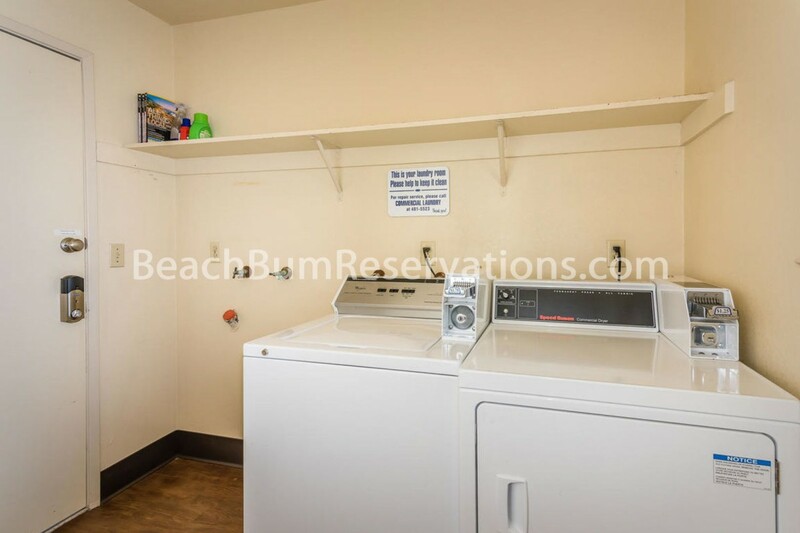 A coin operated full sized washer and dryer are located upstairs, and a bike rack sits just outside your door. The gated side yard is designed to accommodate your sand toys and provides a private entrance to the back yard – making it easy to hose off those sandy feet before entering. If it turns out that you are a group of more than six, or you need a bit more space, the studio unit with queen bed and full kitchen next door is also available and will accommodate another couple. The gates between the two patios can be opened to house a larger gathering - for more information on that unit, just ask our rental agents for additional details. Whether you choose our place or not, we hope you have a terrific holiday in this amazing location. Where else can you go to find oceans, farms, and vineyards in the same locale? Our many climates, things to do, and natural beauties are bound to touch your heart and serve as a backdrop for great memories. All reservations are stay 6 nights get the 7th night free, contact our management company for details. Please contact me with information regarding 188 Stimson Ave No 5. "Thank you for allowing us to stay in your home. Located in a perfect spot, clean and inviting. We really enjoyed ourselves." "5-star, highly recommend 188 Stimson! Amazing beach location. We walked to the beach, into town, then hung out on the sunny patio. Kitchen has everything. Great beds too. All is stylish and comfy with fresh, new interior. We'll come back to 188 Stimson." "My Birthday Weekend! For several years we have been coming to Pismo Beach during summer. Our 7-year old twins LOVED having a room with a TV to themselves. Very comfortable! Thank you for another wonderful Pismo Beach birthday to remember!" "Excellent property! We have been RV'ers for years… so grateful we chose this property as an alternative to getting out 'Central Coast fix'!" "This is an awesome property - exactly what we were looking for. Close to beach and all the restaurants. Kids felt like it was home away from home!" "Thanks for the beautiful place… it was perfect for our family of 4. We will be back!" "Condo is ideal for 2 couples; very clean, in walking distance to beach, downtown and Beach Bum Management Co. We really enjoyed our stay and will rent it again!"